Featherspray was officially launched at the British Craft Trade Fair at the Great Yorkshire Showground, Harrogate, UK on Sunday, 6th April 2014. 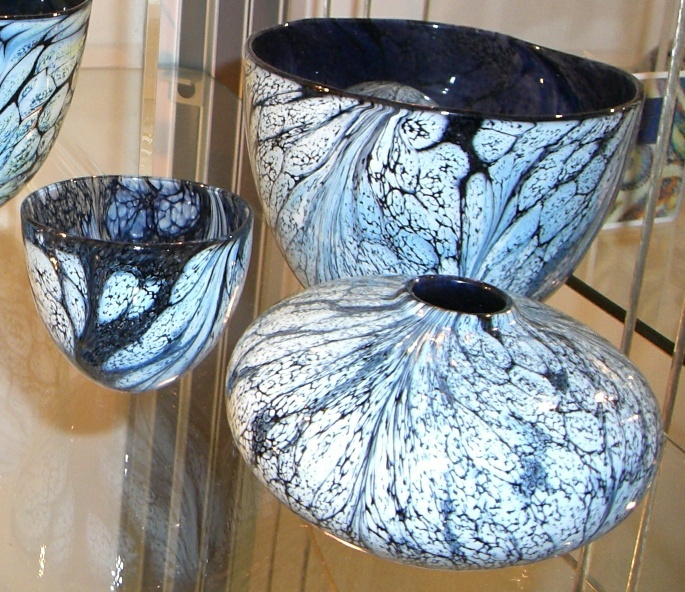 A few trial pieces were made in 2012 and sold through the studio shop at St. Lawrence. Featherspray and Ballon were the first two designs to be produced at the relocated studio at Arreton Barns, Isle of Wight. Unfumed (shiny) colours: Aurora; Copper Blue; Graphite; Jade; Rouge. Fumed (matt) colours: Copper Blue; Lime; Pink. Aurora was the very first and only colourway at launch. However, all the other colourways followed quickly afterward. Unfumed: cylinder vase (22 x 10 cm and 19 x 5 cm); round open bowl (10 x 7 cm); oval open bowl with pad (24 x 19 cm); squat vase (15 x 7 cm and 10 x 4.5 cm); squat perfume bottle (8 x 8 cm and 6 x 6 cm); flask perfume bottle (12 x 8 cm); domed paperweight (7 x 4 cm); almond (oval-shaped) vase (24 x 12 cm and 15 x 7 cm); almond perfume bottle (15 x 6.5 cm and 12 x 5 cm). Fumed: cylinder vase (23 x 10 cm and 15 x 4.5 cm); round bowl with pad (18 x 15 cm and 9 x 7 cm); round perfume bottle (12 x 8 cm and 10 x 6.5 cm); birds (5 x 5 cm and 4 x 4 cm); amphora vase (11.5 cm high x 12 cm wide and 9 cm high x 9.5 cm wide). 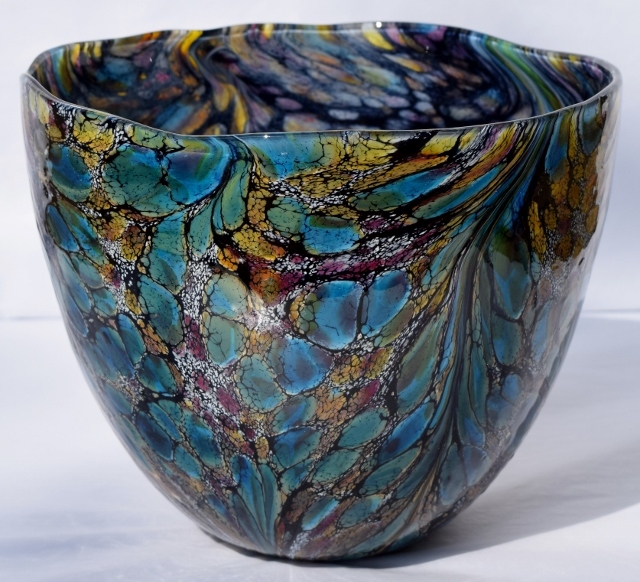 This bowl was bought at the new Arreton Barns studio on 29th April 2014, just six weeks after reopening. 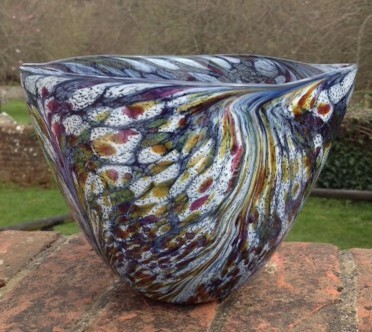 It was the very first piece of Featherspray that Timothy Harris made at the new studio and is signed “Timothy Harris Isle of Wight Glass England 2014”. It is 19.5 cm diameter at the top and 15 cm high. Bowl, 19.5 cm diameter at the top and 15 cm high. Image courtesy of IOWSG. Featherspray Graphite bowls and vase on the shelves of the studio in September 2014. 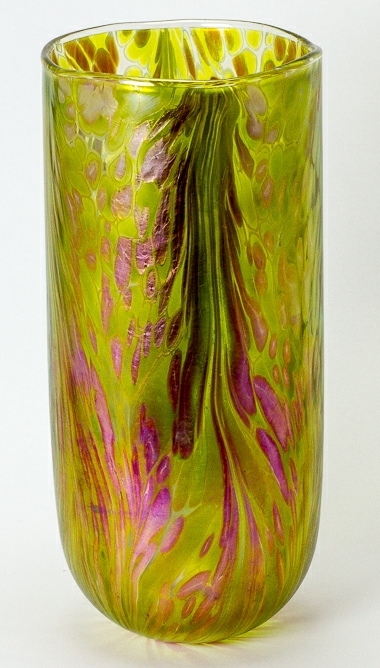 Featherspray Lime large cylinder vase, 23 cm high, 10 cm in diameter. Image courtesy of IOWSG. 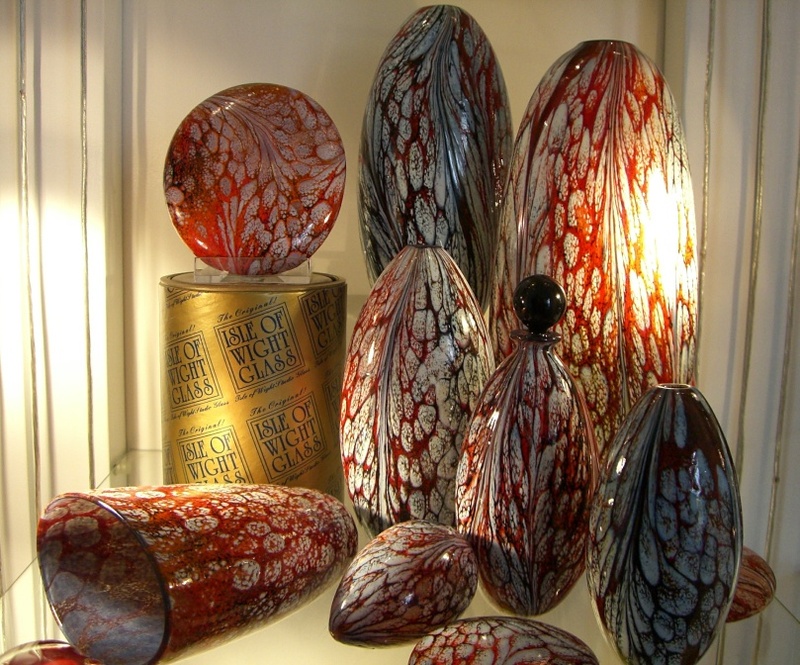 A selection of Featherspray Rouge pieces on the shelves of the studio in September 2014.